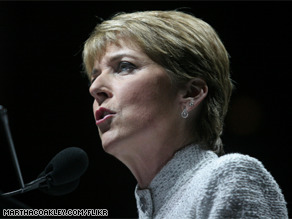 Coakley is leading in a new poll. (CNN) - Massachusetts Attorney General Martha Coakley holds a clear lead in that state's U.S. Senate Democratic primary contest, according to a new poll out Thursday. Rep. Michael Capuano is at 16 percent, and Boston businessman Alan Khazei registered 3 percent in the survey. But the race isn't necessarily over: 20 percent of likely voters remain undecided, and more voters say Pagliuca is running the best campaign. On the Republican side, State Sen. Scott Brown has a big lead over Jack E. Robinsion, 45 percent to 7 percent. Nearly 50 percent of voters remain undecided. The primaries - to determine who will vie to fill the seat long held by the late Sen. Ted Kennedy - are set for December 8. The poll surveyed 600 Massachusetts residents AND was conducted from November 4-8. It has as has a margin of error of plus or minus 4 percentage points. Yes! Finally a woman and not a Kennedy! bot those people up there in Massachusetts never learn. They deserve all the taxes they have and more. no surprize that democraps will elect another liberal loon. This is great news! Martha Coakley is by far the best candidate for the job. She's, as her campaign says 'a new kind of leader' who has a long history of getting things done for Massachusetts. I've heard her speak on several occasions and am always struck by her strength, eloquence and dedication to helping others and improving our state and the country.